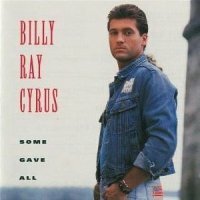 Some Gave All is the debut album by American country music artist Billy Ray Cyrus. It was his first album for Mercury Records in 1992 and became the best selling album of that year in the United States, selling over 9 million copies in the first 12 months of release. It produced four hit singles on the Billboard country charts. The first of these was Cyrus's breakthrough song "Achy Breaky Heart", which topped the charts in several countries. In the US it was a five-week number one on the Hot Country Songs chart, as well as a top 5 hit on the Billboard Hot 100. It became the first single ever to achieve triple Platinum status in Australia and was the best-selling single of 1992 in the same country. Thanks to the video of the song, there was an explosion of line dancing into the mainstream, becoming a craze. The song earned Grammy Award nominations for Cyrus in the categories Record of the Year and Best Country Vocal Performance, Male. That same year, Cyrus also received a Grammy Award nomination for Best New Artist. "Achy Breaky Heart" was originally recorded as "Don't Tell My Heart" by The Marcy Brothers on their 1991 self-titled album. "Could've Been Me", "Wher'm I Gonna Live?" and "She's Not Cryin' Anymore" were also released as singles, peaking at numbers 2, 23, and 6, respectively, on the country charts. The title track also reached number 52 based on unsolicited airplay and Cyrus' cover of "These Boots Are Made for Walkin'" charted only outside the United States. Some Gave All was placed at number 33 in Q magazine's 2006 list, "The 50 Worst Albums Ever!" Overall, the album is his most successful album to date, which has been certified 9× Multi-Platinum in the United States and is the longest time spent by a debut artist at number one on the Billboard 200 (17 consecutive weeks) and most consecutive chart-topping weeks in the SoundScan era. It is the only album (from any genre) in the SoundScan era to log 17 consecutive weeks at number one and is also the top-ranking debut album by a country artist. It ranked 43 weeks in the top 10, a total topped by only one country album in history, Ropin' the Wind by Garth Brooks. Some Gave All was also the first debut album to enter at the number 1 in the Billboard Country Albums chart. The album has also sold more than 20 million copies worldwide and is the best-selling debut album of all time for a solo artist and remains one of the biggest selling albums of all time. Some Gave All was also the best-selling album of 1992 in the US with 4.7 million copies sold. As of April 2019 the album has sold 7,5 million copies in United States according to Nielsen Music. 3. "She's Not Cryin' Anymore"
4. "Wher'm I Gonna Live?" 7. "Never Thought I'd Fall in Love with You"
8. "Ain't No Good Goodbye"
^ a b Hurst, Jack (1993-07-04). "ACHY BREAKY START BRUISED BY THE CRITICS, BILLY RAY CYRUS IS COMING BACK FOR MORE". Chicago Tribune. Retrieved 2010-07-25. ^ "ARIA Charts – End Of Year Charts – Top 50 Singles 1992". ARIA. Retrieved 2010-07-25. ^ "Line dancing refuses to go out of style". Star-News. 1992-10-30. Retrieved 2010-08-12. ^ "Stepping to country fun". The Gazette (Cedar Rapids-Iowa City). 1993-04-17. Retrieved 2010-08-12. ^ "This time around, the country craze proves to have some staying power". Milwaukee Journal Sentinel. 1995-06-13. Retrieved 2010-08-12. ^ Billy Ray Cyrus Explores His Gospel 'Side'. Billboard Magazine. 2003-10-18. Retrieved 2009-06-29. ^ "Mariah Carey Can't Stop Taylor Swift". Yahoo!. 2009-01-28. Retrieved 2009-06-29. ^ "Chart Watch Extra: Ropin' The Biggest Country Hits". Yahoo!. 2008-10-07. Retrieved 2009-10-17. ^ Hurst, Jack (1992-10-16). "COUNTRIFIED KATHY MATTEA IS BACK IN VOICE WITH 'LONESOME STANDARD TIME'". OrlandoSentinel. Retrieved 2010-07-25. ^ Dunkerley, Beville (2 June 2014). "Billy Ray Cyrus Goes 'The Distance' – Premiere". Rolling Stone. Retrieved 17 April 2019. ^ Philips, Chuck (January 5, 1993). "Cyrus, Brooks Give Their All to Record Sales". Los Angeles Times. Los Angeles, California. Retrieved March 3, 2017. ^ Unterberger, Andrew (16 April 2019). "No Artist Has Ever Had a Career on the Billboard Charts Like Billy Ray Cyrus". Billboard. Retrieved 17 April 2019. ^ "Billy Ray Cyrus US Country Albums". Billboard. Retrieved 2009-10-19. ^ "Billy Ray Cyrus Billboard 200". Billboard. Retrieved 2009-10-19. ^ "Issue date April 7, 1992". RPM. 1992-04-07. Archived from the original on October 11, 2012. Retrieved 2009-07-03. ^ "Issue date August 1, 1992". RPM. 1992-08-01. Archived from the original on 2012-10-11. Retrieved 2009-07-03. ^ "UK charts archive". Everyhit. Retrieved 2009-07-03. ^ "Billy Ray Cyrus France charts". InfoDisc. Archived from the original on 2015-07-20. Retrieved 2009-08-02. ^ "Billy Ray Cyrus German charts". Musicline: Media Control Charts. Archived from the original on 2012-09-28. Retrieved 2009-07-03. ^ "Billy Ray Cyrus – Dutch Albums Chart". dutchcharts.nl. Archived from the original on 2012-10-22. Retrieved 2010-02-06. ^ Fernando Salaverri (2005). Sólo éxitos: año a año, 1959–2002. Fundación Autor-SGAE, 2005. ISBN 978-84-8048-639-2. ^ "Some Gave All Oceanian and some European Charts". IFPI Switzerland. Archived from the original on 2012-11-10. Retrieved 2009-08-02. ^ "Top Country Catalog Albums 1995-08-12". Billboard. August 12, 1995. Retrieved July 8, 2011. ^ a b c "allmusic ((( Billy Ray Cyrus > Charts & Awards > Billboard Singles )))". Allmusic. Retrieved 2010-02-06. ^ "Issue date July 25, 1992". RPM. 1992-07-25. Archived from the original on 2012-10-17. Retrieved 2010-08-01. ^ "Issue date October 31, 1992". RPM. 1992-10-31. Archived from the original on 2012-10-17. Retrieved 2010-08-01. ^ "Billy Ray Cyrus – Australian Singles Chart". australian-charts.com. Archived from the original on 2012-10-11. Retrieved 2010-08-01. ^ "Billy Ray Cyrus German charts". Musicline: Media Control Charts. Archived from the original on 2012-10-09. Retrieved 2010-08-01. ^ "Billy Ray Cyrus in the Irish Charts". The Irish Charts – All there is to know. Archived from the original on 2011-07-21. Retrieved 2010-08-01. ^ "Billy Ray Cyrus – Dutch Top 40 Chart". top40.nl. Retrieved 2010-04-02. ^ "Billy Ray Cyrus – New Zealand Singles Chart". charts.org.nz. Archived from the original on 2012-10-24. Retrieved 2010-08-01. ^ "Chart Stats – Billy Ray Cyrus". chartstats.com. Retrieved 2010-02-06. ^ "RIAA singles for "Achy Breaky Heart"". Recording Industry Association of America. Archived from the original on 2015-09-24. Retrieved 2009-10-31. ^ "BPI certification results". British Phonographic Industry. Archived from the original on September 28, 2011. Retrieved 2010-08-01. ^ "Aria Charts - Best of 1992". 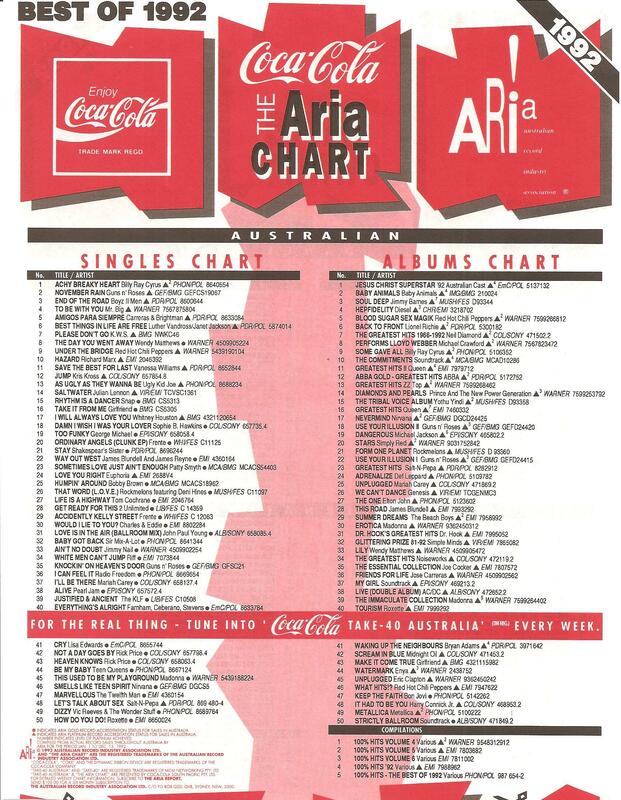 Coca Cola - The Aria Charts. Retrieved 20 March 2019. ^ "Canadian album certifications – Billy Ray Cyrus – Some Gave All". Music Canada. Retrieved 20 March 2019. ^ Dezzani, Mark (23 July 1994). "Some Gave Discs". Billboard. p. 44. Retrieved 20 March 2019. ^ "Danish album certifications – Billy Ray Cyrus – Some Gave All". IFPI Denmark. Scroll through the page-list below to obtain certification. ^ "British album certifications – Billy Ray Cyrus – Some Gave All". British Phonographic Industry. Retrieved 20 March 2019. Select albums in the Format field. Select Gold in the Certification field. Type Some Gave All in the "Search BPI Awards" field and then press Enter. ^ "American album certifications – Billy Ray Cyrus – Some Gave All". Recording Industry Association of America. Retrieved 20 March 2019. If necessary, click Advanced, then click Format, then select Album, then click SEARCH. "In the Heart of a Woman"
This page was last edited on 21 April 2019, at 03:09 (UTC).